Aoeria (A-or-ee-uh) is an independent positive melodic rock band that creates songs from heavy riffs to acoustically strummed odes from the Long Island/New York City area. Frank Giliberti is the singer, guitarist and songwriter and Toby Bruzik, the newest member, plays drums. Aoeria's newly released 2nd album, Praise to All You Hear is now making waves and their first album Waterwheel has gathere...d fans worldwide on internet radio, video sites, and social networking with original songs and bandmade videos with Frank's photography. For more than 12 years each on their own, both Frank and Toby have played in and recorded NY-area bands, and with Aoeria a sound and unique style featuring intense guitar sounds, introspective lyrics and intricate melodies and rhythms culminate in the duo'scollective experiences with music. The band is completely independent: from the music, recording, and pictures, to pressing and designing CDs and DVDs and making websites and videos. Straight from the band, music made to head straight to the ear. Frank and Toby have been playing acoustic and electricshows NY and East Coast area which has allowed then to expand on the vibe of the songs by feeding off the energy in the crowd with improvisation and jamming to spread the melodies and tunes through the air. Thanks for listening and enjoy! "Praise to All You Hear" Reviewed by RadioIndy.com! 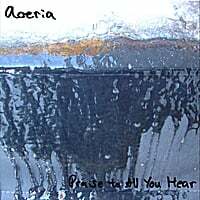 Aoeria's new album Praise to All You Hear out now! Aoeria's new album Praise to All You Hear is out now! Praise to All You Hear is Aoeria's 2nd album of 12 exploratory songs with introspective lyrics and melodious guitars, crashing drums, languid bass. Recorded and performed mostly by New York songwriter Frank Giliberti, who plays guitar, bass, drums, and sings, with drumming by Martin Atkins of PiL, NIN, Killing Joke, Pigface, and more, on The Abyss, and Ryan Egan on bass for Broken Promises. Mp3s are up at CdBaby, Amazon, iTunes, and more. You can order the CD/DVD set from Amazon and it will be coming to CdBaby soon as well as our newly redesigned site at aoeria.com that is in progress. This album has been a real labor of love. We went over everything until it was just how we wanted and we are happy to share it you in higher quality sound then we've ever had before. The DVD has 24bit 96khz and 48khz streams, as well as CD(16 bit 44.1khz) so you can hear the extra range of tone that's closer to what it sounded like in the room when we played it. That's what Aoeria goes for, to make sounds that are descriptive and so vivid you can touch them. Most of the sounds are recorded live, with a few spacial effects added in to bring the sound we hear, which is without limits, for you to hear. The CD/DVD as features Frank's photography and the DVD has a slides arranged to the songs. 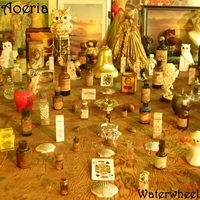 Aoeria and their album "Waterwheel" spin a collection of heavy, gritty, yet straightforward collection of Alternative Rock songs. The opener, "Apocrypha" begins with an exotic explosion of drums and guitars before mellowing down to follow a steady bass line with strong and solid vocals. "Wonder" is more of a relaxed song, at least at first, as it focuses on guitar riffs and reflective vocals before sonic excitement takes over. In "Imminent" we find enlivened drums and guitars keeping up a quick pace in a real rocker of a song. This album is one that harks back to the days when Alternative music was filled with fervent guitars and powerful drumming, while still having its own completely unique feel to it. Fans of Smashing Pumpkins material and similar music should check out Aoeria's "Waterwheel." Greetings! Aoeria is a rock band from New York here to bring you music apart from the norm. Our first album Waterwheel is out now and we invite you to listen! Aoeria took photos while making Waterwheel which became the artwork for the the album, the DVD also features montages/videos for each song using different photos to follow the changes in the songs, and possibly to give some kind of vague bizarre narrative portrayal. PS-the CDs & DVDs are 100% band made and designed!!!! Thanks for listening and checking Aoeria out!!! !